Something we are always thinking about when it comes to the welfare of our chickens, is predators and, more importantly, how to guard against them! Foxes are the obvious ones that everyone knows about, but you've also got birds of prey, badgers, even herons. But some of the worst are Red Mites which, if you don't protect against them, will feed on the blood of the birds. These tiny parasites start off almost translucent but after a feed swell up into red coloured mites which are still only 0.7mm at their largest, making small numbers of them incredibly hard to spot. They live in cracks and crevices and can multiply at an astonishing rate, particularly during the warmer months. While they're not fatal like a fox, they can in large numbers cause discomfort, poor health and ultimately lower egg production. So taking measures to stop them getting anywhere near our birds is a priority. As an organic egg farm, we don't use any chemicals, pesticides or insecticides on our land, so instead we use a diatomaceous earth powder - a 100% natural silicate which comes from the fossilised remains of ancient hard-shelled algea found in river beds. This works because at a microscopic level the powder is incredibly absorbent. It attacks the parasite's exoskeleton by absorbing the oils and fats from the cuticle, effectively causing it to dry out and die. Its sharp edges are abrasive, which speeds up the process and, because it works mechanically rather than chemically, they can't build up an immunity to it. 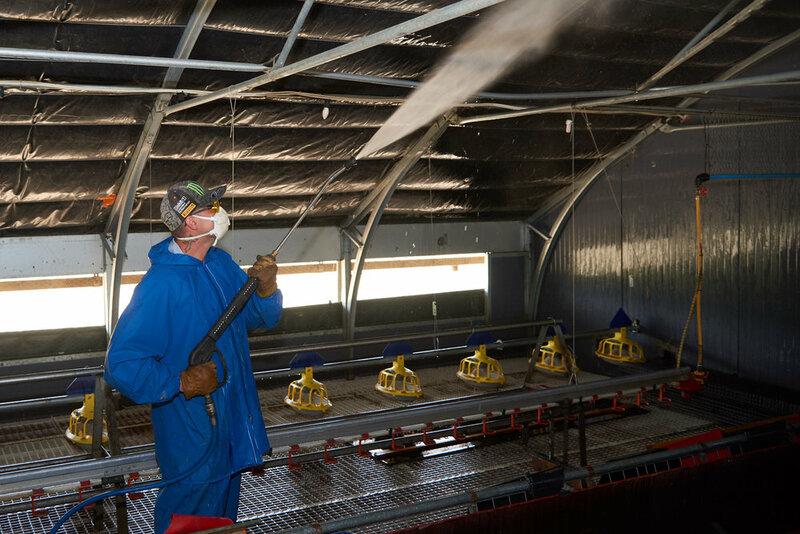 So, after a shed's been moved and thoroughly cleaned, it get's sprayed to guard against Red Mites. The powder gets thoroughly mixed with water and then transferred into a container so it can be sprayed by hand. 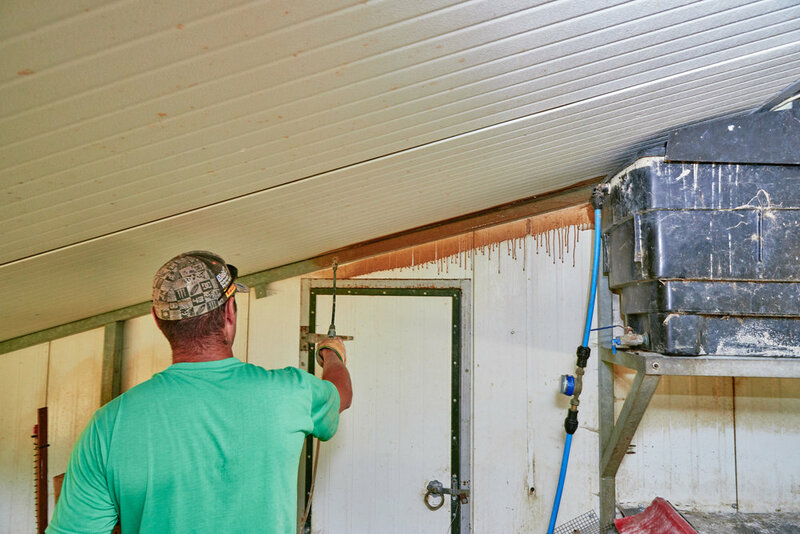 Any crack or crevice creates an ideal environment for them to lay their eggs, so we go over every inch of each chicken shed making sure that every seam gets thoroughly coated with the mixture. As well being applied to every nook and cranny of the hen house we also use it in the hen's scratch areas where the chickens take dust baths to coat and condition their feathers. Usually one application is all it takes, but we're always on the look out and, if necessary, we sprinkle more powder in the nest boxes which usually takes care of the problem. It's a messy, messy job which takes at least a day to get done properly. It's not pretty, and when it's dry it can look like we simply don't take care of our sheds! But it is incredibly effective, and it is essential to guarding against what is possibly the most pervasive predator our chickens face. All that chicken muck from under the floor and the earth from the scratch area is now incredibly rich in phosphates and nitrogen which makes for brilliant fertiliser. There are strict regulations when it comes to these waste materials however, so it all gets dug up and moved to another part of the farm. With far more than we can possibly use on our land, the rest is stockpiled ready to be collected by a variety of other organic businesses including local organic vegetable producers and a company who blends it in with their green compost. The shed is then moved and inspected so that any necessary maintenance can be carried out. With the shed out of the way, we bring in the tractors to rotavate the land which kills off any parasites by exposing them to the sun’s ultraviolet light and prepares the ground for re-seeding. Ageing is something we all have to contend with at some point or another. Despite our best efforts, it's inescapable - doesn't matter whether your human, fish or fowl. Much like us, the older a chicken gets the less productive it becomes. After a year and half or so they start to lay fewer eggs and the shell quality starts to deteriorate meaning, ultimately they can no longer be graded, boxed and sold. 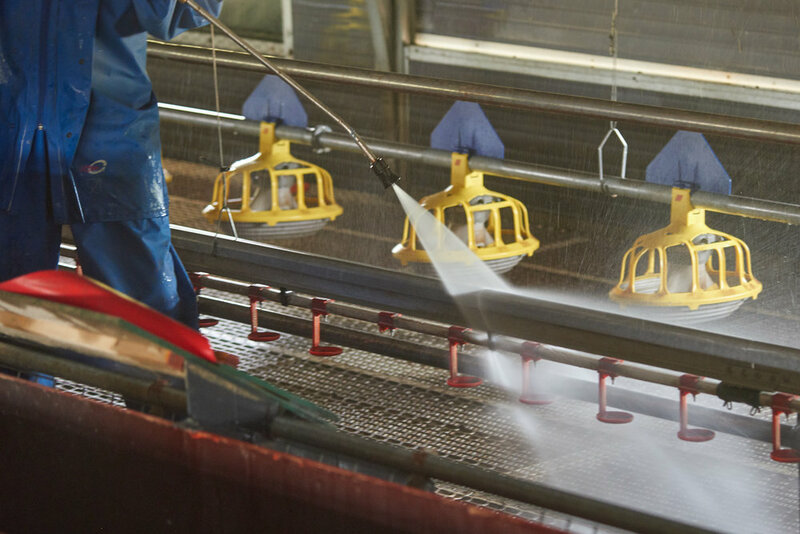 We're an organic egg farm for a reason: the welfare of both our birds and our land is incredibly important to us and something we take great pride in. It's a holistic approach that has worked for us for more than twenty years - we take care of them, and they take care of us. And that sentiment doesn't stop just because they're not able to produce the kind of eggs our customers expect from us. So when it comes to their retirement, whenever possible, we work with Fresh Start For Hens who specialise in finding them new homes. Fresh Start is a not-for-profit organisation with around 200 volunteers nationwide. Whether it's a town, city or country garden; an allotment, school or residential care home, F.S.F.H exist to provide new homes for hens and advice or information to potential new owners. Like us, they are committed to the welfare of the birds and, for that reason, they won't re-home to anyone wishing to sell them on or for further commercial purposes. The work starts before they arrive - we let them know how many birds we have to be collected (2,100 on this occasion) and they go about allocating the hens to new homes and enlisting volunteers to help with collection. On collection day, the team arrives at 5am for an early start when the chickens are slightly more docile. You've heard the expression "it's like herding cats", well this is not dissimilar. It's a well-practiced system at this point which sees one team moving the birds in groups to the scratch area where another team collects them and transfers them to specially designed poultry crates. Another member of the team monitors each crate to ensure that their legs and wings are comfortable and that they're not overcrowded before being moved outside. The poultry crates provide a safe environment for transportation. They wouldn't want to live in one but, for the relatively short amount of time it takes to transport them to their destination it is by far the best solution and causes minimal stress to the bird. 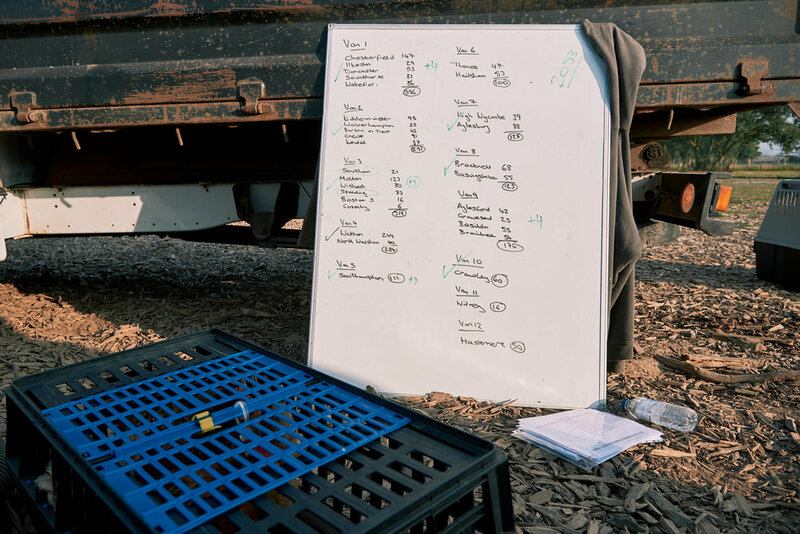 Once they are settled and happy in their temporary accomodation, the team then move them outside so they can be 'counted out' and assigned to one of the waiting vehicle's that have been hired for the job. When a vehicle has it's designated number of birds it heads off to one of 33 collection points around the country, where the birds are let out and await collection by their new families. After about 4 hours of hot and dusty work, the Fresh Start team have rounded up all the birds and get ready for the next phase of their journey. 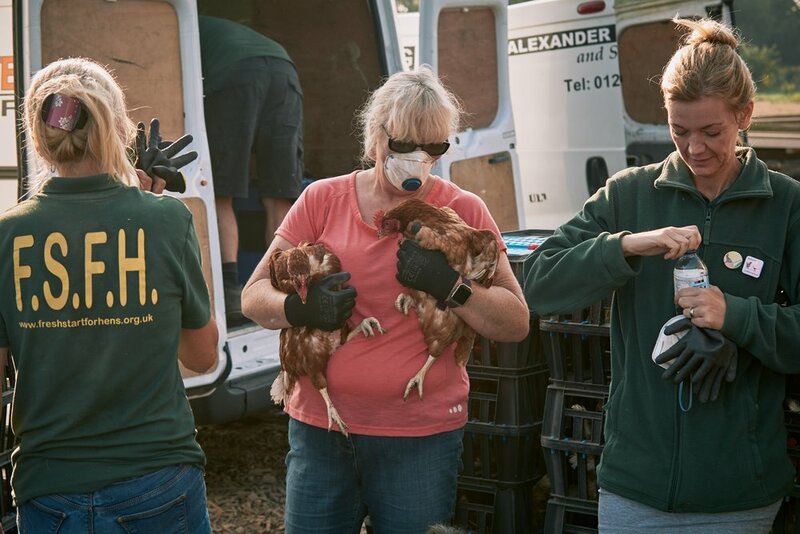 They have collection points from Cumbria to Wales and the West Country and rely on volunteers to carry out the work they do re-homing chickens from farms nationwide. You can register your interest in re-homing by going to fsfh.org.uk or find out more about what they do and how you can help on facebook.